Tracy McGee a psychologist (LLP) with a specialty in alcohol & drug abuse (SPADA). She has spent the last 23 years of her career serving those and their loved ones who struggle with addiction, suicide, death; and the accompanying feelings of depression, anxiety, and panic. 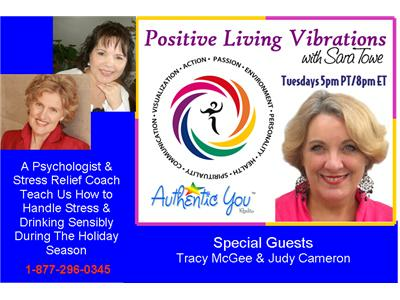 Judy Cameron is a Stress Relief Coach who delivers rapid results using natural and ancient wisdom. Judy will tell us why is it important to sit or walk in good posture, especially during the holidays to release festive stresses.